About Belmar Fishing Club // Our history. On September 1, 1909 , the Belmar Fishing Club was first organized with forty-nine charter members. The first meeting of this newly organized club was held on that date in Charles Reimuller's Hardware Store located on F Street , near 8 th Ave , Belmar N.J. The following men attended the first meeting of our Club: David McIntyre, George J. Simpson, Frank Kain, Howard Kain, Charles Reimuller, Henry Reimuller, Harry C. Cole, William A. Herbert, Chaster Robotham, and F. R. Lefferts, Jr. A committee was appointed to nominate officers and drew up a constitution and by-laws to be acted upon at a meeting scheduled for September, 1909. At the meeting, held on September 8, 1909 , the constitution and by-laws presented by the committee was adopted. The following named officers were elected and installed: President, George J. Simpson; Vice-President, Harry C. Cole; Treasurer, F.R. Lefferts, Jr., and Secretary, B.C. Reimuller. Board of Governors: David McIntyre, Chester Robotham, J.Harry Mount, William A. Herber and L.J. Brown. The manes of the forty-nine members who had signed the charter roll were read and approved. Annual dues were only $1.00. Arrangements were made with the Ocean Pier Co. to to construct a clubroom and for use of the pier. In order to provide a meeting place for the club, the Ocean Pier Company built what was at that time considered a commodious clubroom. To further create a greater interest in pier fishing, season tickets were issued to the member of the Belmar Fishing Club at a special rate. On September 1, 1919, or exactly 10 years from the date the Belmar Fishing Club was first organized, the trustees who were appointed by the President reported that out of one hundred and six shares (106) outstanding of the Ocean Pier Company, fifty seven (57) had been transferred to the Belmar Fishing Club either by gift or purchase which gave the Belmar Fishing Club control of the Ocean Pier Company, and the club property. 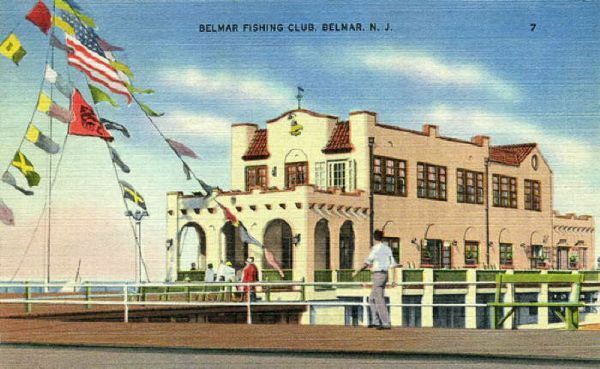 During the summer of 1929, the Club's counsel was successful in having certain restrictions in the original deed modified so as to permit the Belmar Fishing Club to erect a new and larger club house to meet the demands of its growing membership. Therefore, on June 14, 1929 the Belmar Fishing Club Holding Co., was incorporated for the purpose of holding the property for the benefit of the members of the Belmar Fishing Club and to finance and build a new club house. On September 21, 1929 , the foundation was laid. On May 30, 1930 the Club House which we now occupy was officially dedicated as a fisherman's paradise - truly a shrine for sportsmen.